The 30 new cardinals that Pope John Paul II is naming Tuesday come from around the world and will join the list of possible successors to the ailing 83-year-old pontiff. There is also a 31st new cardinal, but his identity is a secret - a practice the Vatican sometimes employs when a new cardinal is from a nation where the church is oppressed by that country's government. 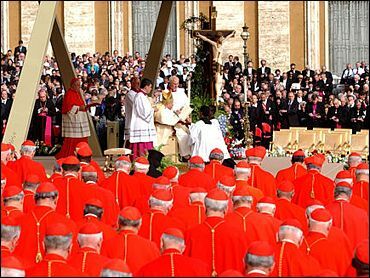 In a solemn ceremony Tuesday, the pope is giving the new "princes of the church" their red hats and declaring them members of the elite band of churchmen who will elect the next pope. The 31st cardinal won't be able to vote on that unless the pope makes his name public before the date of the conclave - the term for the meeting of cardinals at which a pope is selected - usually, but not necessarily, when a pope dies. "We don't know whether (the conclave) will be in one month or five years," said one of the new cardinals, Scottish Archbishop Keith O'Brien. "But that's really the priority for cardinals." The pope's increasing frailty, on display during a rigorous week of ceremonies surrounding his 25th anniversary, has added poignancy to Tuesday's consistory, which some Vatican observers say may be his last. As a result, the current roster of cardinals is considered to be the list of possible popes, since cardinals largely choose from among themselves for the top job in the Roman Catholic Church. The new group includes prelates from the Sudan, Nigeria and India, where the church faces challenges from Muslims and Hindus. The pope's concern for poverty in Africa and his interest in giving Africans greater visibility was clear in his naming of Ghana's first cardinal. Tuesday's ceremony increases to 194 the size of the College of Cardinals. But only 135 of them are under age 80 and thus eligible to vote in a conclave. Of those 135, John Paul named all but five. Yet picking the next pope from among them is anyone's guess, since the group is still large and geographically diverse. "It's funny, nobody is whispering 'He'll be the next man,'" said Cardinal Lubomyr Husar of Ukraine. "Nobody has arisen as a personality." The college has gotten so large that cardinals wore tags with their names and home dioceses during meetings at the Vatican last week. John Paul's latest appointments to the College of Cardinals have broadened it geographically and increased the possibility of a Third World pope. Certainly, there are a handful of contenders, or "papabili," including one of the new cardinals: Italy's Angelo Scalo. He's the patriarch of Venice - a position that produced three popes in the 20th century. Even before he received his red hat, Italy's Angelo Scola was dubbed "papabile," - a potential successor to the pope. He's the patriarch of Venice, a post that produced three 20th-century cardinals. Italian pundits speak of blocs being formed pitting the Italian cardinals against the Latin Americans. Some also speak of the possibility of an African pope, with speculation centering on a Vatican-based Nigerian, Cardinal Francis Arinze. Archbishop Anthony Olubunmi Okogie, Nigeria's new cardinal, said in a news conference before leaving Lagos for Rome that the pope has given African countries a greater voice. "The country will be heard from," he said. "If there is anything that we want to say, not just religious-wise, spiritual, moral, but concerning states, too." Cardinal Francis George, archbishop of Chicago, says that with the Catholic Church a universal church, "the field is open in that sense" - but he does exclude one nationality: Americans. "An office like the papacy needs to be free. And to some extent, even the appearance of being in some sense captured by, as we say now, the world's only superpower, would not be helpful to the mission of the church," George said. The 31 new candidates come from around the world, from Australia to Zagreb, Vietnam to Venice, and on the whole follow John Paul's conservative bent. O'Brien, however, made waves a few weeks ago when he suggested that celibacy and contraception should be up for discussion. Current church teaching requires celibacy for priests and bans contraception. At a press conference Monday, O'Brien stressed that he merely meant that he would participate in a discussion of those topics if it arose, but that he fully obeyed John Paul's teachings. "When a decision is made, I accept," he said. O'Brien is the third Scottish cardinal. Ghana is getting its first with Peter Kodwo Appiah Turkson, the archbishop of Cape Coast. "The Holy Father always looks around to make sure that every part of the human race within the church is recognized in the College of Cardinals," observed Cardinal Theodore McCarrick, archbishop of Washington, D.C. "And he's accomplished it really well." Indeed, under John Paul the college has gotten more international and less Italian, although Europe as a whole still is the largest bloc, followed by the Latin Americans. The Polish-born John Paul broke 455 years of Italian dominance of the papacy when he was elected pope in 1978. One of the dominant questions now is whether the cardinals will return the papacy to the Italians or look for another nationality, perhaps someone from the developing world. "This question of continents isn't so important," said Claudio Hummes of Brazil, himself considered a papal contender. "The important thing in this moment is to ask who could help the church and the world now and in the future." John Paul named the new group on Sept. 28, acting months before he was expected to amid increasing concerns about the toll his Parkinson's disease was taking on him.